Pope Francis presides over the Via Crucis. POPE FRANCIS HAS deplored the suffering of migrants, victims of racism and persecuted Christians as 20,000 worshippers gathered at Rome’s Colosseum to hear his Good Friday prayer. “Christ, our only saviour, we turn towards you this year with eyes lowered in shame,” the Pope told the crowds outside the former gladiators’ battleground, their faces lit by candlelight. “Shame for all the images of devastation, destruction and shipwrecks which have become ordinary in our lives,” Francis said in an apparent reference to Mediterranean migrant disasters that have left at least 590 people feared people dead this year. The Pope also spoke of the child abuse scandals that have rocked Catholicism in recent years, expressing “shame for all the times when bishops, priests and the religious have scandalised and hurt” the Church. “Shame for the innocent blood, spilt daily, of women, children, migrants, people persecuted for the colour of their skin or for their social or ethnic group, or for their faith in you,” he said. The Easter holy week commemorating the last days of Jesus’s life had a bloody beginning last Sunday with attacks claimed by the Islamic State group on two Coptic churches in Egypt that left 45 people dead. Egyptian Copts observed a solemn Good Friday with prayers and fasting, as the community reeled from the bombings. Despite concerns over security, Francis is planning to go ahead with a visit to the country later this month. In Rome, security was tight for the night-time ceremony, with road blocks and metal detectors in place as worshippers gathered to hear the leader of the world’s 1.3 billion Catholics. Three thousand officers were deployed to protect the Colosseum. This year an Egyptian couple and their three young daughters carried a large cross for part of the Via Crucis (Way of the Cross) procession, descending through the Colosseum and then outside into the crowd. Worshippers from Portugal and Colombia, two countries the pontiff is set to visit in May and September respectively, also took part in the procession, taking turns to carry the cross along with two Chinese Christians. A small group of believers carry a cross between 14 “stations” evoking the hours in the run-up to Jesus’s crucifixion during the Via Crucis procession. 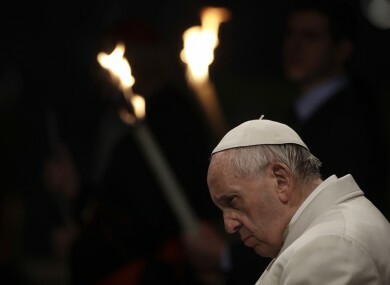 Francis, 80, sat under his traditional red canopy next to a large cross lit with torchlight for the ceremony, which for the first time included a meditation written by a secular woman, French professor Anne-Marie Pelletier. Good Friday is the second of four important days in the Christian calendar beginning with Holy Thursday and culminating in Easter Sunday, which commemorates Christ’s resurrection. Email “'We turn towards you with eyes lowered in shame': Pope blasts migrant suffering in Easter prayer”. Feedback on “'We turn towards you with eyes lowered in shame': Pope blasts migrant suffering in Easter prayer”.